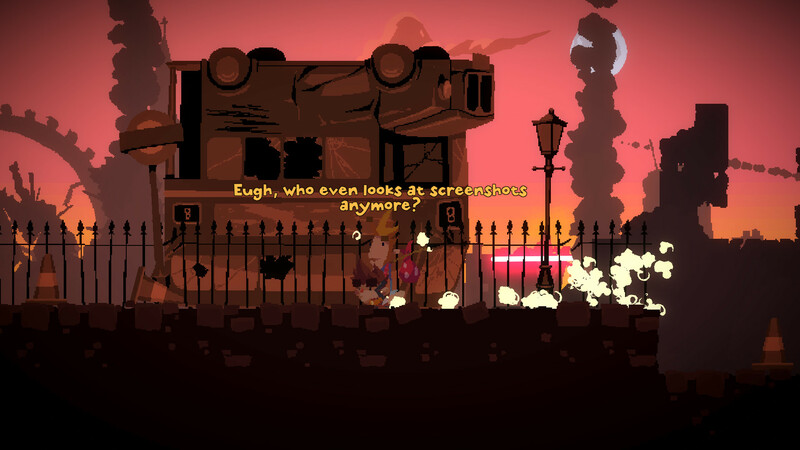 Size Five Games are today best known for The Swindle, the procedural heist-‘em-up launched in 2015. Before that, however, the studio created two hilarious adventure games: Ben There, Dan That, and Time Gentlemen, Please! At this year’s EGX Rezzed convention, Size Five unveiled a direct successor to those early games, albeit one with a somewhat different twist. Lair of the Clockwork God is the third Ben and Dan game, but it is simultaneously an adventure game and a platform game, one that combines the verbs and interactions of classic LucasArts titles with the leaping and jumping of, well, every game from Super Mario Brothers to Super Meat Boy. Dan: Ben was really worried you were going to start asking us about graphics cards. I’m the games guy. That means I just write stupid stuff. Dan: We only know stupid stuff. How many graphics does this game have? Dan: Oh, this has got most of them. We’re not using any reds, but apart from that, we’ve got all of them. Dan: No, no reds. Can’t put reds in the game. Ben: Couldn’t figure it out. Dan: No, too many different codes. Okay, seriously, what brought this about? Because obviously you’ve done Dan and Ben games before, and then you started doing other stuff. How did you come back to this? Dan: I know it feels like we’ve been away for quite a long time. But we have been talking about this solidly since the last game came out. I know that I made The Swindle, and Gun Monkeys and Kickmen have been out in that time, but behind the scenes Ben and I have been meeting regularly, and we have made Dan and Ben Games, we’ve cancelled Dan and Ben games, we’ve talked about some in embryo that were really good that got cancelled. There are several versions that got canned behind the scenes, and I think Lair of the Clockwork God is kind of a culmination of all those ideas, all those meetings in pubs and all those scrawled notes of ideas that worked and didn’t work. I know it feels like we’ve been away, but to us this has just been one long journey. One long development process. What’s Lair of the Clockwork God about? What are you trying to do? Dan has decided there’s no money to made in adventure games any more, and he’s gonna be an indie darling platformer. He wants to go on worthy quests and do lots of running and jumping and wall-climbing and jumping on baddies’ heads and things. So the game is basically about the interplay between those two characters, about them helping each other out, and progressing the story. Dan: It’s a single-player coop game. Perfect. How did you get to the point of making this? You said there were other versions you toyed with, so what were those? Dan: Ben is the keeper of the lore. Ben remembers things for long periods of time, whereas it all falls out of my brain. Ben: Uhm, yeah. So I guess, so the one thing that we’ve been trying to do since we discussed making the game, is keep it interesting and not just make the same game again. And that’s why there have been a lot of discarded attempts. So I think the main thing that this is built on is: Why were those things not interesting? Why did they feel too similar to the old stuff, and what can make it new? Dan: I think that’s the thing. They were good ideas, they were interesting ideas, enough that we were excited about making them. But when we did, we just felt like we were recycling content, we were making the same jokes, and the same mechanics, and the same stuff again. Ben: But I think we’ve moved towards being more standalone as well. At the start it was very tied into the ongoing story. And we were like 'How do we make the end of the second one create a new story organically?' And as we moved through the different versions we thought we actually need to get away from that and start a new story. That’s the old saga and this is the new Dan and Ben saga. Dan: We had a really good idea for a sequel in the pub last night. We quite like the idea of Ben There, Dan That, and Time Gentlemen, Please! as being like a duology, and then doing two of these as well. They’re not trilogies; they’re two separate duologies. Ben: Can we call them diptychs please? So what’s the loose premise of this particular adventure? Dan: The loose idea is that Dan and Ben stumble across an old computer that has forgotten what it’s like to be human. Well, what humanity is. So it’s all about Dan and Ben teaching that computer the human experience. The computer generates worlds to initiate an emotional response from them. It can observe that data and understand what joy is, what fear is, and that sort of thing. So it’s learning over a period of time, all of these different emotions, and the game’s just basically about Dan and Ben trying to stave off some apocalypses. Dan: No, all of them. The idea is that all of the apocalypses are happening at the same time. So robots, zombies, alien invasion, earthquakes, the lot, it’s…demons…all happening at the same time. And so the only chance for salvation is for Dan and Ben to teach this computer. Ben: What it feels like to be happy and what it feels like to be angry and sad. Dan: Yeah you might call them levels. So is it going to be structurally similar to those previous games, or not? Dan: Structurally, actually it’s a platform game. There’s a hub world, and then there’s bits that come in and out of it. The idea was, we love point and click, we are old-school LucasArts fans. But those games don’t gel brilliantly with modern life, or where we’re at now. There’s a lot of standing around talking, there’s a lot of dialogue, there’s a lot of conversation trees. So this game, we wanted it really forward-focussed. It’s structured like a platform game, so everything is driven, there’s no back-tracking... we’ve done everything we can to cut away the fatty waste bits, but maintain the stuff that we really love, which is mainly a large number of verbs and a huge inventory and combining items together. And having options, which is all the stuff that was starting to get cut away from those style of games. How do you control both of the characters? Dan: You flip between them. You can control one at a time, so Ben can go off and do his point and click stuff, and you can then select Dan who can run and jump and set things up for the next end bit. After a while, the idea is that Ben is constantly making things for Dan to upgrade him so he can reach new areas and improve his abilities. We hit this design problem where Dan would run off and then Ben’s still all the way back, so we were constantly trying to engineer ways to keep them together. So part of it is tight level design, and part of it is the piggybacking system, so Dan can pick Ben up and carry him, so you don’t have to walk the same way twice with two characters. Ben: You don’t want to get down all the way through one level as Dan and have to switch to Ben and walk him through the level as well. Dan: And then you get a teleporter later on. That then becomes a puzzle thing, like you get Dan to a certain area and then you can teleport up to there to access new areas. We did a lot of work to make sure that the switching between the two characters isn’t annoying. Sounds quite mechanically complex. It must have been tricky to figure out how it was going to hang together. Dan: And honestly the answer to all of these design problems is we’ve just been talking and talking and highlighting the problems and then we meet up and we talk, and the game has been slowly designed over the last eight years or so. Ben: I think another challenge, because character Dan is a platformer and has a limited set of moves, is to keep on coming up with inventive ways of working those into puzzles, not just have it be, 'Okay, Dan’s going to push this over the side so that Ben can get to it' every time. Dan: There is a lot of that [laughs]. Ben: We had to set a limit. But yeah, to integrate him cleverly into adventure-game puzzles was quite challenging. Dan: Also there are sections where he runs off on his own, by design, pure platforming sections, which works really nicely because it means you don’t get bogged down in one or the other two departments. So you’ll just finish a really nice point-and-click-heavy section, and then there’ll be a nice loose bit of platforming [like a] palette-cleanser. How did you approach the art, because the Dan and Ben games have a…distinctive art-style. Let’s call it doodlish? Dan: Yeah, people always called them 'MSPaint' which I think is really unfair, because I did it in Paint Shop Pro. So Ben and Dan was obviously a free game, and it was a joke to promote Gibbage. It was a thing we weren’t anticipating doing well at all; it was just a thing to drive traffic to Gibbage, so [Ben] kept on saying to me, 'It doesn’t matter what it looks like. It’s about the jokes. It’s about the puzzles.' I reluctantly agreed. And then [with] Time Gentleman, Please! I tried to put a bit more effort into it, but it was still kind of limited by my inability to do proper art. Then after that it started to become more pastiche-y of indie games, less a pastiche of Mega-Drive era platformers and more about your Meat Boys and your Celestes, stuff like that. So when we started to imagine this version we’re in now, pixel art was the only real option. And I can sort-of do pixel art, not brilliantly, but I can do it. Ben: I think it looks gorgeous. I think the art has all come together really well. Pixel art is like.. there’s a science to it, there’s a whole school of thought on pixel art. 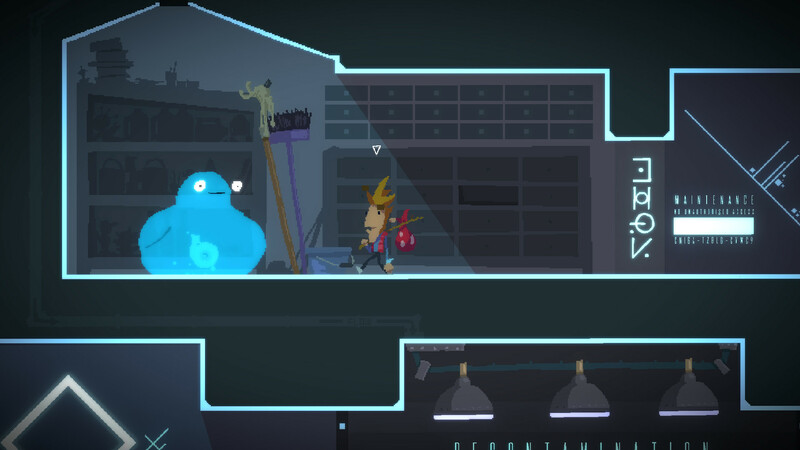 So you’ve got your basic adventure game/platformer duality. How do those two sides interact, and how do you build upon that through the course of the game? 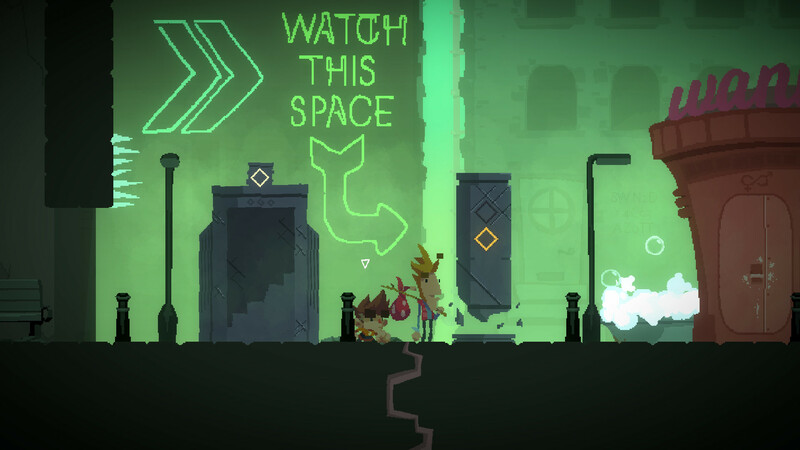 Ben: A lot of it is geared toward platforming and how [Ben] can help Dan be a better platformer. Dan: When Dan starts he’s fresh from being a point-and-click adventurer himself; in the original games he’s sort of Ben’s sidekick. So when you start the game he can just run and jump. In fact, he can walk and jump. Dan: Yeah, or canter. And in the game, as you see in the trailer, he gets a double-jump boost. There’s wall-grabbing and there’s running and piggybacking and all sorts of upgrades that he can get. Dan: Who knows? No one would put a gun a point and click game, that makes no sense. Ben: That’s true, that would break all the puzzles. Dan: But maybe a gun. Actually I hadn’t thought about that. Does the gun break all the puzzles? Yeah, we should have a conversation about whether the gun breaks all the puzzles. Ben: We should just take Dan out, maybe. Dan: [laughs] We’ve changed our minds. Just takes Dan and Ben out and have only environments. Ben: Just call the game 'Ben 1'. Dan: No, let’s not do that. Let’s talk about audio. What are you doing with that? Dan: A guy called Toby Evans is doing it, who did the audio for The Swindle, and put together an amazing soundtrack. Well, he did the music for The Swindle, but he didn’t do the sound effects; the sound effects I did. He did the trailer. That trailer went up three times in quality when he sent back his stuff. The music is really difficult. I wanted something that indicated the pastiche of indie games, that sort of sweeping orchestral, I just wanted like a piano and cello, like morose. And it just didn’t work in the situation. Dan and Ben are telling these stupid jokes and being glib to each other, and then there was this Max Payne theme-tune stuff going in. We talked about how the gut reaction is to make a piece of music that loops and just play it over the whole thing. And I said I didn’t want that either, I wanted something that was more flashback, and at key moments the music would kick in, so it has a heavy reliance on ambient noise. So the trailer’s got this constant, almost musical ambience to it, with the birds chirping in the background. Dan: And yeah, it works so well. It’s so good, he’s such an astonishing talent, it’s amazing. You said that Lair of the Clockwork God is a pastiche of indie games, so is it a gentle lampooning, or more of a critique? Ben: It’s a bit of affectionate ribbing, but at the same time we’re doing the same stuff. We understand why all these adventure games had all these weird tropes, because actually you had to do all of those to get it to work. So now we’re doing a similar thing with indie games and platformers. But yeah, rather than do any sort of specific parody of a game, like you know, having a black and white character show up called Bimbo or something. Ben: It’s more about the state of indie game culture. Dan: It’s pulling out themes and tropes. This is a good example, but a lot of indie games tell a story with like giant floaty text. It’s something I find really hard, because I can never follow it. Like The Swapper did it. Do you remember The Swapper? And there was obviously a lot of story, and I had no idea what it was because my brain didn’t work well enough to retain that method of storytelling. I was seeing a paragraph at a time. And Braid did it as well. So we’ve got a bit of that. Ben: But it’s like a thing you see come up in indie games, because it’s like, 'How do we tell these stories without a AAA budget? ', and one of the things to do is put text up. So that’s like an indie game thing that we play with, and stuff like that. Lair of the Clockwork God is currently scheduled for release on August 31st 2019 on Steam.